I have a small issue with the City of Oakland (California) website and in trying to solve the problem, I finally found a subject that I can wax poetic about at a City Council meeting! At the Public Safety Committee Meeting on Tuesday, Sept 11th, City Council Member Pat Kernighan asked those who may be watching (*snicker*) to download a progress report by the Oakland Police Department on what they are doing to reduce crime in Oakland. Kernighan expressed concern that there was a small turnout at the Public Safety meeting, especially since Public Safety is the number one topic of concern to Oakland residents. She then asked those who were watching at home to download the Police Crime Reduction Progress Report from ‘the Public Safety Section of the city’s website’. Only problem with that suggestion? The Public Safety section of the Website under City Council only contains a small paragraph. No documents. 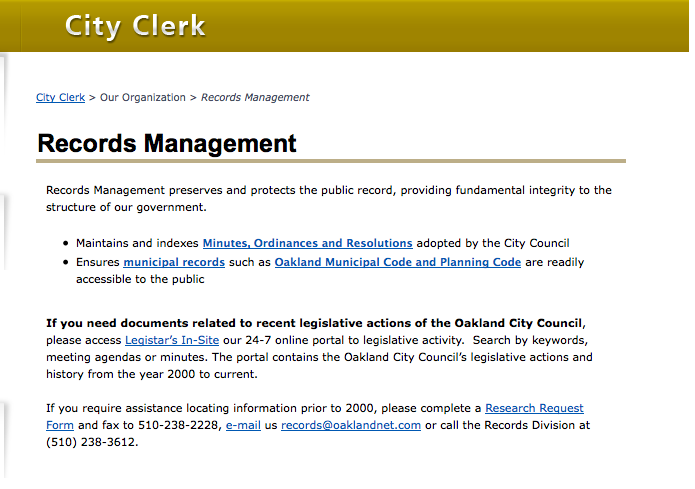 In FACT if you want to find documents presented to City Council on the city of Oakland website you are going to have a slightly difficult time. You won’t find the documents under the City Council heading. The link to posted Council documents are actually under the City Clerk, on another website entirely, called “Legistar“. Is Legistar clearly linked in the City Council section of the website? No. You can find a link to ” Meeting Schedule, Agendas & Minutes” ..but that link takes you to a calendar not to any documents that are presented at the meeting (accept the agenda). This ‘calendar’ page is a part of the Legistar site, but it’s not clear and if you don’t know to explore Legistar you won’t find what you are looking for. Legistar is nested within the City Clerk’s section under Records Management. But you have to know to go there to look for it. I didn’t know. I had to ask twitter for a link to the report, after searching fruitlessly. OPD’s twitter account is pretty responsive and sent me a link to the report after 5 minutes. This kind of hunting for information prohibits transparency. This seems like such a small complaint, but it really can turn people off from fully participating in government. I’m what you would call semi-experienced in navigating the internet..yet I had to do some serious clicking and going back and forth to find what I was looking for. In the end I had to turn to twitter. 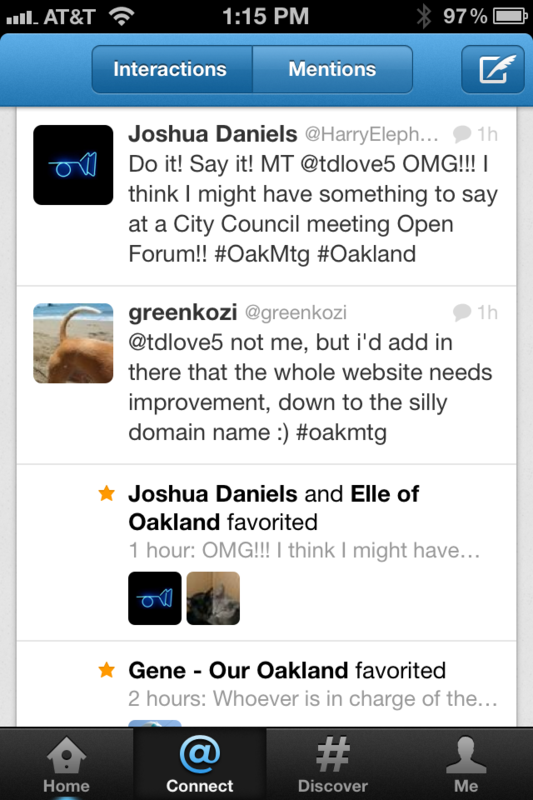 I shouldn’t have to ask twitter, much less bother the Oakland Police twitter account in order to find information! The police should be preventing crime, not catering to my amateurish investigative reporting needs..
Download City Council Agendas and Documents on the City Clerk Website: Legistar!! Add it Big and Bold. Right in the center. It would take two minutes. I could do it for you for free if you don’t have the funds to pay for it. I have other suggestions, but this is something you can do today. Try it! Let’s help Oaklandnet.com be better! I’m not alone in my opinion that the city of Oakland’s website needs help. After coming to the realization that I need to speak up about this at Open Forum encouragement and other suggestions came thru on twitter. So here is my offer: You tell me what else you would like to see changed about the website to make it easier for the public to navigate and or just make it prettier, and I will present this list to the City Council at Open Forum. Share your suggestions via comments and I will put it together in a document submitted to city Council. A twitter friend suggested that I wait until the next city council meeting (not the one coming up Tuesday Sept. 18) to speak. That meeting is going to be on October 2nd. So you have until October 2nd to post your suggestions! SHARE! 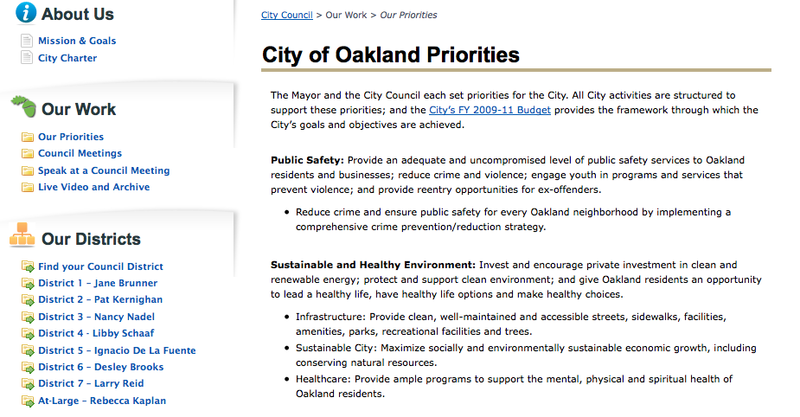 What do you think can be done to improve the City of Oakland Website? 6 Responses to City of Oakland Website needs work! Share your suggestions. 1. Domain name: http://www.oaklandnet.com- hard to find and tell to someone else. 2. Layout: not user friendly. Many of your suggestions are excellent examples. Also ugly. I’m pretty sure that this would be a cheap and worthy fix. A dedicated Oakland resident might even be willing to do it. 3. Sloppy: For example, on the “Residents” page, the library is listed at least 3 times, and some of the links in the bottom section are not aligned properly. This is amateurish. Larry Reid is still listed as the Council President. Wait…isn’t he still Council President tho? I think a couple months ago it turned over? And yes, Larry Reid is the Council President.